A couple of years back, a few friends and I were riding through the mountains above Taos, New Mexico. In the process of exploring, we took a "detour" through some tiny mountain towns. Suddenly, a friend got a flat on his Honda SuperHawk. There we were in the middle of nowhere (albeit a beautiful corner of nowhere), with darkness nearing. To make a long story short, he pulled out a plug kit and inflation CO2 cartridges. The repair was successful, and we safely made it to Taos before dark. 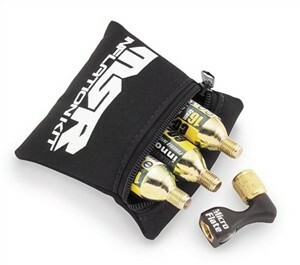 The MSR Tire Inflation Kit is a good option for the inflation of repaired tires. It includes a unique and ingenious L-shaped valve connection which requires no hoses. This adapter will work well in the tight spaces inherent in motorcycle rims. It also includes three CO2 cartridges and a carrying case. You will notice I did not mention the repair kit included in this kit. That's because there isn't one. May kits include patches or plugs. However, I believe MSR feels that the repair kit will be specific to the bike on which the product will be used. Dirt riders will bring a patch kit or spare tube, while street riders will bring a radial tire plug kit. The MSR kit is a good, compact tool. Just remember that it does not include the repair portion. Click here to find this tire inflation kit on Revzilla.com.